Year End Report of Human Aid by Texas and Суть времени (CB - "Essence of Time") in Donbass. Money that was sent for specific projects went 100% to those projects. Money that was sent with no specific target was used on various human aid projects, logistics and to support journalism by Texas and Essence of Time Info Center. The money to Texas and CB Info Center went to logistics to deliver human aid (gas, tires, etc) and to support our information work. Texas and CB together produced and posted over 350 videos in 2016, as well as written articles, photo essays, radio and TV appearances. Our work has been translated into English, Russian, Polish, Spanish and Serbian, and our videos and programs have gotten over 3 million views in the last year. That's an average of one new video a day and 8,220 views a day, every day. Суть времени donated and delivered a $10,000 ventilator to the Ilovaisk Regional Hospital. This piece of vital medical equipment has already been used to save lives, and will continue to do so for years to come. We are also working with our comrades in the Patriotic Forces of Donbass volunteer organization, who have repaired dozens of war-damaged homes, and completely rebuilt 2 homes from the ground up, in the small town of Nikishino. This work continues. Суть времени instituted a program 2 years ago called "From Kids in Russia to Kids in Donbass". Through this program, we have collected, shipped and delivered 47,466 kilos from 259 different schools and universities in 45 different towns in Russia, and delivered it to schoolkids throughout Donbass, both the DPR and LPR. This averages out to about 1,000 pounds a week, every week for the last 2 years. Суть времени soldiers continue to defend the Donetsk People's Republic in some of the hottest areas of the front lines. Texas and the Info Center camera crew will continue to visit them there and report back. The military war is ongoing, and the Info War is getting hotter all the time. Human Aid continues to be a vital pillar of support to people in Donbass effected by the war. On the military, Information and Humanitarian Fronts, Суть времени is out front, on the Front, every day. 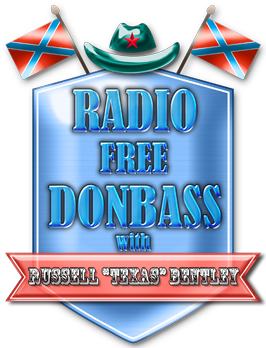 Texas and Суть времени will continue to defend and support the people of Donbass, Russia and the world in the fight against neo-fascism. As our enemies (and your enemies too), the nazi apologists and professional liars of the Ukrainian and Western media continue to employ ever more propaganda and censorship, the Information War becomes more important and more difficult. But the truth is a powerful weapon, and the truth is still the truth, even in the face of a thousand lies. So it is not a question of whether we will win in the end, we will. But how long it takes is up to you, it is up to every one of us to do their part in this battle for the future of Humanity, this struggle to make a better world for us all. We want to send a heartfelt thanks to all who contributed their time, effort and money to this worthy cause. Your continued support is now more important than ever. To those who have not yet contributed, now is the time. We need financial support to continue our work, but there are other ways to make real contributions. Sharing and re-posting our information is always a big help, and you can start your own social media group or accounts to help spread the truth. We also need volunteers for video editing, subtitles and translation. Don't just be a spectator in the war for truth and the future of Humanity. Wherever you live, this is your war too. Join us, do your share, and together we can only win. We begin 2017 with renewed determination and vigor, and the hope that this will be the year that fascism is defeated and we can begin to build a free, just, and multi-polar world based on truth, equality, international law and cooperation, a better world for all.